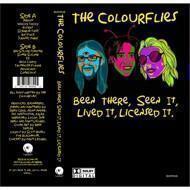 The Colourflies Blackhouse Records debut, "Been There, Seen It, Lived It, Licensed It" is now available on a limited edition run of only 100 ccassettes. Hand numbered with a pink cassette tape, it comes housed in a glowing day-glo orange cassette case and features alternate artwork and layout exclusive only to the cassette version of the record. 13 total tracks clocking in right under 50 minutes, this critically-acclaimed grungy bubblegum rock monster of a record will make your life just that much better!